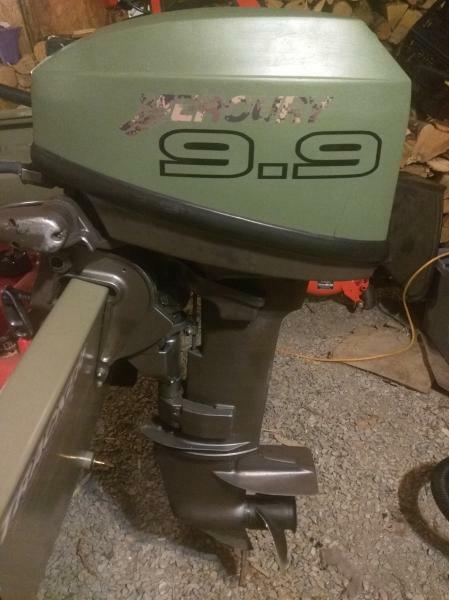 Can anyone here tell me how to find new "Name" decals for my little outboard? I've just tried the Evinrude site, and got no where. It would help to know what year and model outboard you're looking for, but I found replacement decals for my Evinrude SkiTwin on eBay. There are tons of listings for different models, just do a search for "Evinrude decals" and a bunch come up. as mentioned above, year and model will help. that this guy has in his ebay store. -or- stop by your local sign sticker shop and see what they can do for you. Last edited by Johnny on 15 Oct 2016, 12:50, edited 1 time in total. if you don't want to pay $60-70 for replicas on Ebay there is a seller, fatmans_stickes that has some more generic brand stickers and he will do requests too.. I painted my old 9.9 bucket in olive drab green added some camo merc stickers. not perfect but much nicer than the house numbers the previous owner had stuck all over it lol. Last edited by Riverrabbit on 15 Oct 2016, 18:05, edited 1 time in total. I thank all of you who answered. I will try and find out the year and model and go from there. Again...thank you all. Your motor's serial number, typed into Google with the brand name, should bring you the year and even the model info.